Love To Crop! 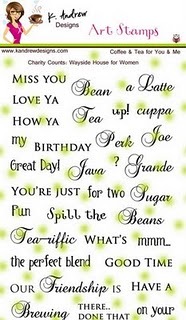 : Getting Cricky Simply Sunday Challenge -- Java Great Day!! Getting Cricky Simply Sunday Challenge -- Java Great Day!! I decided to show you a project you may have seen from me before.... 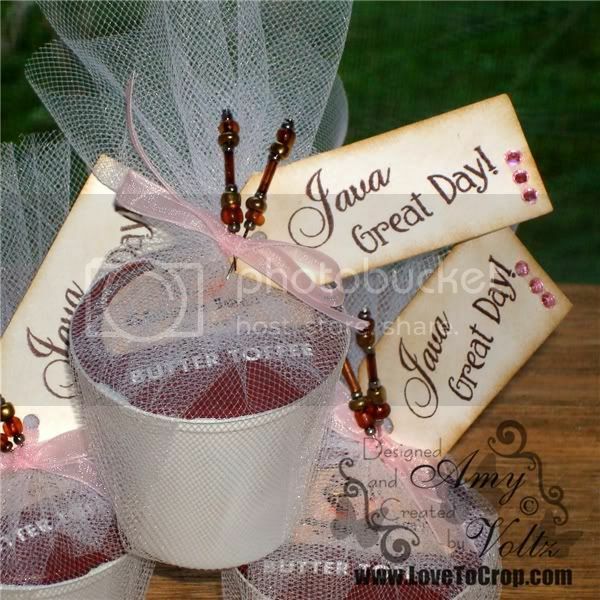 Some sweet little coffee favors!! Be sure to check out all the WONDERFUL Stamp Art Sets by K Andrew Designs... Then, I hope you'll hop on over to see what all of my Design Team Sisters made for inspiration and enter YOUR project for this week's Simply Sunday Challenge at Getting Cricky... We can't WAIT to see what you create!! Dont' forget to stop by and see Kristal's NEWEST Stamps available HERE!! Amy, I love your little pin. They are so Adorable and add the perfect amout of color and flare to your projects. I also love this k-cup idea. My husband is a principal and we like to try to do little things for the teachers every once in a while and these are a great idea! Thanks for sharing. I just love this idea and how they all came out. Amazing as always Amy...you are a true artist! Great Sunday, glad you are relaxing. I want to enter that challenge, but just order my stamps and won't be getting them i'm sure for several days. I love your project for tea-time! What a cool idea! Those pins are adorable!!! Great job! Hey Amy, Great job with these I am not a coffee drinker but this is a really neat idea for those who are!! The saying is so perfect and what a cute little gift for people. 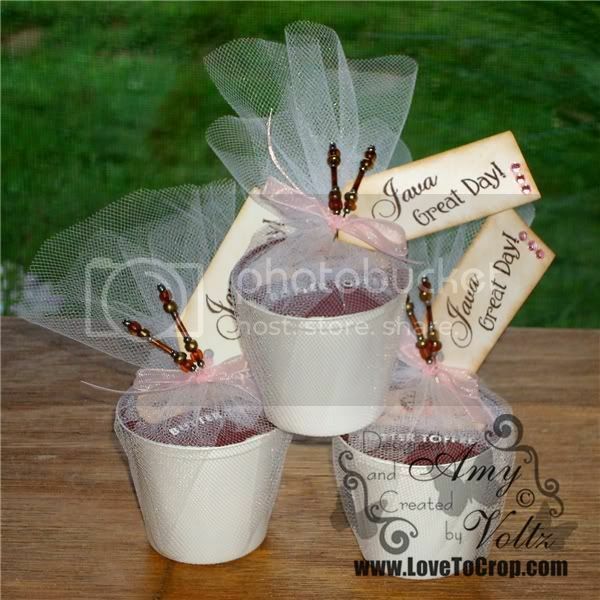 I love you little coffee favors and how you decorated them. How did you do the stick pins? Did you clip them off short and kinda glue them into the tulle to keep them from slipping? I'm very curious because when I make my stick pins I don't like leaving the long extra piece of pin hanging. this is such a cute idea I love it. glad your taking a break you deserve it girlfriend. Amy, These are great little coffee treats to give. The tags are great. I love the way used Kristal's stamps. I am so excited about being on the DT with you. This is a great idea. I use my Kuerig often and I really like this idea to use as a gift. Very neat idea, would work with Tea bags too I think! Thanks for the awesome project. I was just popping in because I'm having Amy withdrawals. I missed this post earlier. Cute idea and I love the pins, they're so pretty. Amy, these are so cute and perfect for the coffee drinker. I like using coffe mugs with Hot chocolate and chocolate candy...comfort things for a long hot bath in the winter...or...put anything to drink/combo. Great idea! Amy all of your work is so clean and beautiful. You should become a professional at this, and teach classes.